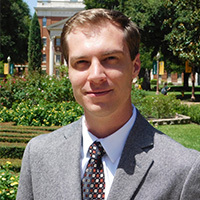 Spencer joined Baylor’s graduate program in the fall of 2016. A California native, he received a Bachelor of Arts degree in English from San Diego State University in 2009 and a Master of Fine Arts degree in creative writing from the University of Oregon at Eugene in 2014. At Baylor, he looks forward to studying classical political philosophy and American political thought, with close attention to the works of Plato, Xenophon, Aristotle, Shakespeare, Tocqueville, Nietzsche, and Strauss.